The square was designed as part of the representative boulevard Brienner Straße by Karl von Fischer working for Crown Prince Ludwig of Bavaria and laid out by Leo von Klenze. Fischer modeled the Königsplatz on the Acropolis in Athens. The concept was classical rigor embedded in living green, and so an expression of urban ideas of Ludwig I. who wanted to see cultural life, civic ideals, Catholic Christianity, royal administration and the military all together and embedded in green. Klenze framed the square with the "Ionic" Glyptothek and the "Doric" Propylaea (Propyläen; created as memorial for the accession of Otto of Greece). The "Corinthian" State Museum of Classical Art was erected by Georg Friedich Ziebland, on its back St. Boniface's Abbey is situated. 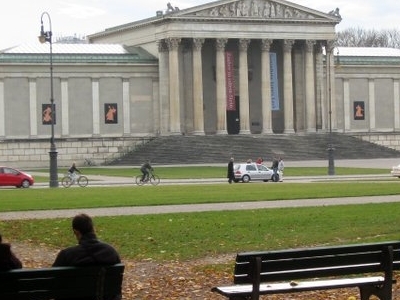 The Glyptothek was built from 1816, the Propylaea were only completed in 1862.The Lenbachhaus is situated at the north-west side of the square. As a beautiful and monumental place, the Königplatz was used during the Third Reich as a square for the Nazi Party's mass rallies. The Brown House, the national headquarters of the Nazi Party (Nationalsozialistische Deutsche Arbeiterpartei) in Germany was located at 45 Brienner Straße close to the square. Two "Honor Temples" (Ehrentempel) were erected at the east side for the remains of the sixteen Nazis who died in the 1923 Beer Hall Putsch. Both temples were demolished by the US-Army in 1947, although their platforms remain to this day. Two buildings of the Nazi party constructed by Paul Troost next to the temples still exist; in one of them, the Führerbau, the Munich Agreement was signed in 1938. 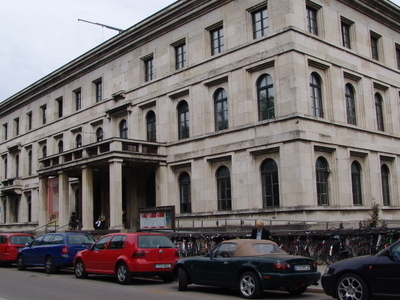 Today it is a school for music and theatre called the Hochschule für Musik und Theater München. Here's the our members favorite photos of "Plazas and Squares in Munich". 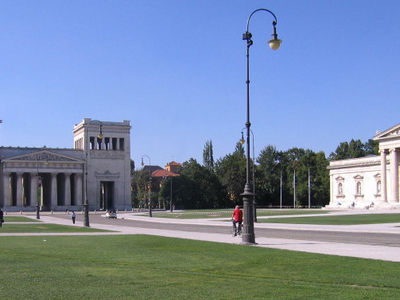 Upload your photo of Königsplatz!